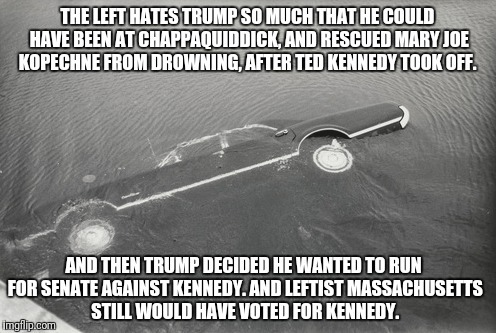 THE LEFT HATES TRUMP SO MUCH THAT HE COULD HAVE BEEN AT CHAPPAQUIDDICK, AND RESCUED MARY JOE KOPECHNE FROM DROWNING, AFTER TED KENNEDY TOOK OFF. AND THEN TRUMP DECIDED HE WANTED TO RUN FOR SENATE AGAINST KENNEDY. AND LEFTIST MASSACHUSETTS STILL WOULD HAVE VOTED FOR KENNEDY.